Perhaps the biggest impact on your health and wellness comes from your diet. What you eat and how your body processes it affects everything from your day to day wellness to your long-term health. That’s why it’s important to focus your diet in a positive way, staying as close to natural foods as possible. Mother Nature’s Food, Inc. makes it easy to maintain a natural food diet! Our nutrition store in Eau Claire, WI is stocked with absolutely everything you need to eat healthfully and happily. We sell only food products in the raw and those that are minimally processed and packaged. The result is a nice selection of foods, fitting any type of diet you might be living on. And if there is something you don’t find we have the flexibility to bring in what our customers are looking for. Stop in today!! Not all natural food grocery stores in Eau Claire, WI carry diet-specific food options. You might find a few gluten-free options here and there or a small selection of dairy-free foods—but these products are usually few and far between. Best of all, we also carry trusted name brand pre-packaged products for dietary-conscious individuals on-the-go. Look to us for Amy’s and Navitas products, among others. Our selection of raw food products provide the nutrients you need to eat healthfully. From organic seeds and nuts, to sulfite-free dried fruits, to locally-sourced meats, we’re proud of the selection we’re able to offer. 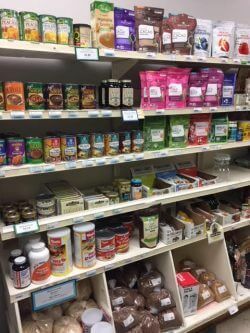 Our health food shop in Eau Claire, WI is also home to a huge selection of bulk herbs and spices. Whether you’re a tea drinker and like to put your own combinations together, an avid chef or just like to get your spices fresh, we welcome you. For more information about any of the products we stock or for information about any of the types of natural foods we offer, stop in today or give us a call at 715-834-2341.